Deepak Sambhara, MD, Harikrishnan Vannadil, MD, MS (Ophthal), Peter Bracha, MD and Vinay A. Shah M.D. Assigned status Up to Date by Vinay A. Shah M.D. on September 11, 2016. Sickle cell retinopathy is an ocular manifestation of the spectrum of sickle cell disease, an inherited group of hemoglobinopathies with numerous systemic and ocular presentations. Hemoglobin is an iron containing protein in red blood cells that transports oxygen. It consists of two alpha polypeptide chains, each of which pairs with a beta, gamma or delta chain. The predominant hemoglobin molecule in mature circulation is Hemoglobin A (HbA), which consists of two alpha and two beta subunits. Hemoglobin F consists of two alpha and two gamma chains, and is the predominant hemoglobin until 6 weeks of age. Hemoglobin A2 consists of two alpha and two delta chains and is found at low levels in normal adult human blood. A single nucleotide mutation (GAG to GTG) at the 6th position of the beta chain causes the substitution of the amino acid valine for glutamic acid. Heterozygosity for this mutation results in sickle cell trait and homozygosity results in sickle cell disease (SCD). Other mutations in the beta subunit can result in hemoglobin SC disease (HbSC) and sickle thaslassemia (HbSThal). Retinal hemorrhage associated with SCD was first published in a case report by Cook in 1930. In 1937, Harden demonstrated a consistent finding of dilated and tortuous retinal vessels in patients with SCD, and this finding was further substantiated by Klinefelter in 1942. However, it was not until 1942 that the underlying mechanism of sickle cell retinopathy was proposed. Ray and Cecil suggested that occlusion of small vessels by sickled erythrocytes caused the observed changes in retina. This work was further driven by Verhoeff, who, in 1947, provided pathophysiological basis of vitreous hemorrhage, neovascularization and infarction due to sickled cells. In African-Americans in North America, the incidence of sickle cell trait (AS) is about 8%, while that of SCD is 0.4%. The incidence of SC, AC and S-Thal genotypes among African-Americans in North America is 0.2%, 2% and 0.03%, respectively. Importantly, the incidence of proliferative retinopathy is highest in patients with SC or S-Thal (33% and 14% respectively), while patients with SS have a 3% incidence of proliferative retinopathy. Normal blood cells that are round and oval can easily pass through smaller blood vessels including capillaries. However, local hypoxic conditions alter the shape of the red cells in SCD patients, leading to rigid, sickle-shaped red blood cells (RBCs), due to the irreversible conversion of soluble hemoglobin into crystalline hemoglobin. Changes in the adhesive properties of capillary endothelial cells due to hypoxia lead to deceased vascular flow and occlusion of vessels.This trapping of sickle-shaped red cells in the small blood vessels in various structures of eye, both in the anterior and posterior segments, leads to characteristic damage. The clinical manifestations vary depending on the presence or absence of vaso-proliferative changes. Hence, this disease can be classified as non-proliferative sickle cell retinopathy (NPSR) and proliferative sickle cell retinopathy (PSR).. The retinal changes in NPSR occur secondary to vaso-occlusion and local ischemia. Occlusion of retinal vasculature first appears in the peripheral retina as “salmon patches”, which represent retinal hemorrhage from superficial blood vessels. These lesions are round or oval in shape and can be elevated or flattened (Figure 1).Although they are initially red, they become salmon-colored due to the hemolysis of red blood cells. Over time, the hemorrhage is resorbed and the area appears normal with refractile deposits, which are iridescent spots of hemosiderin and macrophage deposition just beneath the internal limiting membrane. 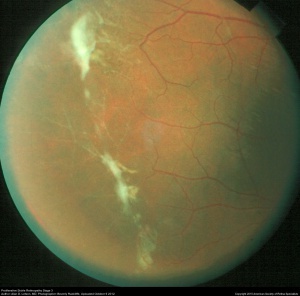 Migration and proliferation of retinal pigment epithelium (RPE) leads to the development of black sunburst spots which likely occur in response to hemorrhage. Reduction in visual acuity is usually from the occlusion of perifoveal capillaries, causing a concave macular depression from RPE degeneration. Occlusions in the choroidal circulation with associated breaks in Bruch’s membrane are known to cause angioid streaks, a phenomenon seen in many retinal diseases including NPSR and PSR. Figure 1. 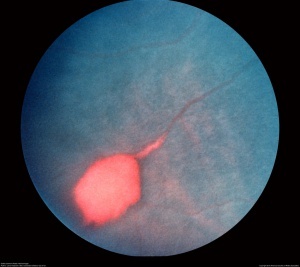 Salmon-patch hemorrhage in sickle cell retinopathy. (This image was originally published in the ASRS Retina Image Bank by Larry Halperin, MD, Retina Group of Florida. Sickle Salmon-Patch Hemorrhage. 2012; Image Number, 1789. © the American Society of Retina Specialists). As noted above, the ocular complications of PSR are more characteristically seen in HbC (SC) and SThal disease, rather than in SS disease. As localized vascular occlusion leads to the changes described above in NSPR, chronic changes of local hypoxia and ischemia lead to the upregulation of vascular growth factors, which may result in retinal neovascularization, pre-retinal or vitreous hemorrhage and tractional retinal detachment. Neovascular and fibrous proliferation (sea fan) (Figure 2) occurring at the posterior border of nonperfusion. A subsequent white sea fan appearance is due to auto-infarction of the neovasculature (Figure 3). Figure 2. Sea fan formation with neovascularization. Fluorescein angiogram image of an individual with sickle cell retinopathy showing sea fan formation with neovascularization. This image was taken using an Optos P200MA ultra-wide field imaging device. (This image was originally published in the ASRS Retina Image Bank by Michael P. Kelly, FOPS Director, Duke Eye Center Labs, Duke University Hospital, Sickle Cell Retinopathy. 2012; Image Number, 721. © the American Society of Retina Specialists). Figure 3. Proliferative sickle retinopathy stage 3 with auto-infarction of sea fans in a 21-year-old man with SC Disease. 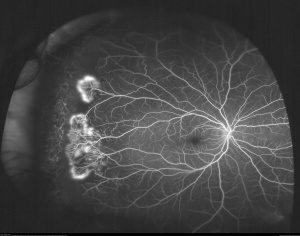 (This image was taken with a fundus camera and was originally published in the ASRS Retina Image Bank by Alan D. Letson, MD, OSU Eye and Ear Institute, Photographer: Beverly Radcliffe. Proliferative Sickle Retinopathy Stage 3. 2012; Image Number, 1224. © the American Society of Retina Specialists). While extra-retinal fibrovascular proliferation is seen in other disease entities, most commonly diabetic retinopathy, neovascularization in PSR typically begins peripherally, rather than centrally as in diabetic retinopathy. Visual loss in PSR occurs most commonly due to vitreous hemorrhage and tractional retinal detachment. Vaso-occlusion of conjunctival vessels leads to the development of “comma” shaped vessels due to the accumulation of sickled RBCs at the distal end of the capillaries. Vascular changes in the optic disc are transient, but present as dark red lesions also visible as dilated dark capillary vessels on fluorescein angiography. Patients may see flashes, floaters or dark shadows, which may be indicative of vitreoretinal traction or detachment. Sickle cell retinopathy should be distinguished from the conditions listed below. A prior history of sickle cell disease helps rule out many of these conditions, although it is possible for these conditions to occur simultaneously with NPSR/PSR. The goal of therapy for NPSR/PSR is to prevent development of ischemia, infarction and the dreaded complication of neovascularization. Complete ophthalmic examination twice a year is recommended for sickle cell patients (SC,SS, S-thal, etc). Baseline fluorescein angiography may be performed to examine blood flow in the retina and choroid. As complications of PSR arise, intravitreal administration of anti-vascular endothelial growth factor (anti-VEGF) therapy and/or scatter laser photocoagulation may lead to regression of neovascularization. The high incidence of neovascularization and spontaneous regression complicates treatment modalities. Feeder vessel photocoagulation to close sea fan structures with argon laser over Xenon arc is preferred as Xenon arc tends to damage Bruch’s membrane, thus increasing the risk of choroidal neovascularization.Similarly, 360-dgree scatter photocoagulation of the peripheral retina has been shown to reduce the number of sea fan structures due to neovascularization, although a protective effect is better with feeder vessel photocoagulation. In the event of vitreous hemorrhage, patients need to be examined at regular intervals to document clearance and resolution of visual acuity. Surgical indications include non-clearing vitreous hemorrhage, tractional retinal detachment of surgical severity or combined tractional and rhegmatogenous retinal detachment. Pre-operative systemic management should be optimized to reduce the risk of ocular and systemic comorbidity, and consultation with a hematologist or primary care provider should be considered. During surgery, oxygenation and hydration should be optimized to prevent this risk of a sickle crisis. To reduce the risk of anterior segment ischemia, a scleral buckle should be used with caution. Intraocular pressure should be monitored to reduce the risk of ischemia intraoperatively. Due to the risk of retinal detachment post-treatment, scatter photocoagulation is the preferred method of intervention to cause regression of sea fan structures if the sea fans do not auto-infarct. However, retinal tear and rhegmatogenous retinal detachments may occur after scatter photocoagulation. The rate of surgical complications in patients with PSR has been reported to be as high as 50% for traction/rhegmatogenous retinal detachment in a recent study. Scleral buckling surgery also carries higher intra- and post-operative risk with similar complications as pars plana vitrectomy in patients with sickle cell disease. American Academy of Ophthalmology. Retina/Vitreous: Sickle cell retinopathy Practicing Ophthalmologists Learning System, 2017 - 2019 San Francisco: American Academy of Ophthalmology, 2017. ↑ Part II: Ocular lesions associated with sickle-cell disease. Acta Ophthalmologica. 27 MAY 2009 ed1959:18. ↑ Fekrat SG, Morton F . Sickle Retinopathy New York: Thieme Medical Publishers. ; 1998. ↑ Michiels C, Arnould T, Remacle J. Endothelial cell responses to hypoxia: initiation of a cascade of cellular interactions. Biochimica et biophysica acta 2000;1497:1-10. ↑ Emerson GG, Lutty GA. Effects of sickle cell disease on the eye: clinical features and treatment. Hematology/oncology clinics of North America 2005;19:957-73, ix. ↑ Jampol LM, Condon P, Dizon-Moore R, Serjeant G, Schulman JA. Salmon-patch hemorrhages after central retinal artery occlusion in sickle cell disease. Archives of ophthalmology 1981;99:237-40. ↑ Friberg TR, Young CM, Milner PF. Incidence of ocular abnormalities in patients with sickle hemoglobinopathies. Annals of ophthalmology 1986;18:150-3. ↑ Goldberg MF. Natural history of untreated proliferative sickle retinopathy. Archives of ophthalmology 1971;85:428-37. ↑ Penman AD, Serjeant GR. Recent advances in the treatment of proliferative sickle cell retinopathy. Current opinion in ophthalmology 1992;3:379-88. ↑ Roy MS, Rodgers GP, Podgor MJ, Noguchi CT, Nienhuis AW, Schechter AN. Conjunctival sign in sickle cell anaemia: an in-vivo correlate of the extent of red cell heterogeneity. The British journal of ophthalmology 1985;69:629-32. ↑ Nia J, Lam WC, Kleinman DM, Kirby M, Liu ES, Eng KT. Retinopathy in sickle cell trait: does it exist? Canadian journal of ophthalmology Journal canadien d'ophtalmologie 2003;38:46-51. ↑ Fritch CD. Traumatic hyphema. Annals of ophthalmology 1976;8:1223-5. ↑ Walton W, Von Hagen S, Grigorian R, Zarbin M. Management of traumatic hyphema. Survey of ophthalmology 2002;47:297-334. ↑ Chow CC, Genead MA, Anastasakis A, Chau FY, Fishman GA, Lim JI. Structural and functional correlation in sickle cell retinopathy using spectral-domain optical coherence tomography and scanning laser ophthalmoscope microperimetry. American journal of ophthalmology 2011;152:704-11 e2. ↑ Estepp JH, Smeltzer MP, Wang WC, Hoehn ME, Hankins JS, Aygun B. Protection from sickle cell retinopathy is associated with elevated HbF levels and hydroxycarbamide use in children. British journal of haematology 2013;161:402-5. ↑ Gustave BW, Oliver SC, Mathias M, et al. Reversal of paracentral occlusive retinopathy in a case of sickle cell disease using exchange transfusion. Ophthalmic surgery, lasers & imaging retina 2013;44:505-7. ↑ McKinney CM, Siringo F, Olson JL, Capocelli KE, Ambruso DR, Nuss R. Red cell exchange transfusion halts progressive proliferative sickle cell retinopathy in a teenaged patient with hemoglobin SC disease. Pediatric blood & cancer 2015;62:721-3. ↑ Canan H, Ulas B, Altan-Yaycioglu R. Hyperbaric oxygen therapy in combination with systemic treatment of sickle cell disease presenting as central retinal artery occlusion: a case report. Journal of medical case reports 2014;8:370. ↑ Freilich DB, Seelenfreund MH. The use of hyperbaric oxygen in the treatment of retinal detachment in patients with sickle cell disease. Israel journal of medical sciences 1972;8:1458-61. ↑ Mitropoulos PG, Chatziralli IP, Parikakis EA, Peponis VG, Amariotakis GA, Moschos MM. Intravitreal Ranibizumab for Stage IV Proliferative Sickle Cell Retinopathy: A First Case Report. Case reports in ophthalmological medicine 2014;2014:682583. ↑ Moshiri A, Ha NK, Ko FS, Scott AW. Bevacizumab presurgical treatment for proliferative sickle-cell retinopathy-related retinal detachment. Retinal cases & brief reports 2013;7:204-5. ↑ Jampol LM, Condon P, Farber M, Rabb M, Ford S, Serjeant G. A randomized clinical trial of feeder vessel photocoagulation of proliferative sickle cell retinopathy. I. Preliminary results. Ophthalmology 1983;90:540-5. ↑ Rednam KR, Jampol LM, Goldberg MF. Scatter retinal photocoagulation for proliferative sickle cell retinopathy. American journal of ophthalmology 1982;93:594-9. ↑ Jampol LM, Farber M, Rabb MF, Serjeant G. An update on techniques of photocoagulation treatment of proliferative sickle cell retinopathy. Eye 1991;5 ( Pt 2):260-3. ↑ Myint KT, Sahoo S, Thein AW, Moe S, Ni H. Laser therapy for retinopathy in sickle cell disease. The Cochrane database of systematic reviews 2015;10:CD010790. ↑ Chen RW, Flynn HW, Jr., Lee WH, et al. Vitreoretinal management and surgical outcomes in proliferative sickle retinopathy: a case series. American journal of ophthalmology 2014;157:870-5 e1. This page was last modified on October 9, 2018, at 15:03.